Home / Interesting Stories / 5 Crazy Car Facts! It is always fun knowing some crazy and unique car facts. You never know when you’re going to need to know them, but it is always fun to wow and surprise people with your knowledge. Below I have listed 8 crazy car facts. Did someone really pay $10,894,900 USD on a car? Yes. In 2008, a 1961 Ferrari California Spyder was sold at a vintage car auction. Someone (unnamed) paid a staggering $10,894,900 on the vintage motor. This was soon classified as the most expensive vintage car auction. Renting a supercar? Why not hire a Lamborghini Tractor? 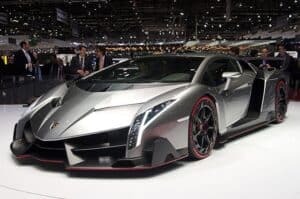 Back in World War II, Ferruccio Lamborghini was merely a young mechanic in Italy’s Royal Air Force who had a love for ‘supercars’. The Enterprising young man would capitalise on the spare military equipment and convert it into tractors. Yes, Ferrari did in fact start as a tractor manufacturer. A few years later, the business took off and Ferruccio decided to follow his love for sports cars and develop Lamborghini’s from tractors into cars. Automobili Lamborghini was formed in 1963. Most of these cars were named after bulls, as Ferruccio was an avid follower of bull fighting and sports. Unfortunately, business began to decline in 1970 and Ferruccio sold the interest of his company. Surprisingly, Volkswagen is now the ‘owner’ of Lamborghini. The bestselling car in both America and Britain is easy to park, super lightweight, uses no fuel or electricity… and is a toy car. It has been revealed that the Little Tikes Cozy Coupe has the highest car sales in both the countries mentioned. The recognisable red and yellow plastic car has been a huge part of most people’s childhoods. Created in the 1970’s the toy car reached 6 million unit sales by its 25th anniversary in 2004. This car has out sold popular models such as Ford and Volkswagen. Unfortunately, Little Tikes Cosy Coupe isn’t on our fleet, but one day we may have the bestselling car ready for rental. Speeding ticket for going 13mph? In 1986, British man Walter Arnold received the first parking ticket. Walter was going 8mph in a 3mph in Kent. Walter was classed as a ‘reckless tearaway’ as he sped through the streets at a crazy 8 mph… Back in these days you were only permitted to drive a car if there was a person walking in front waving red flag to warn nervous pedestrians of your presence. These speeds are very different compared to the level of speed you can reach in our supercars. Don’t worry, you won’t get a ticket for going 8mph in our prestige cars either! Typically, people assume Bentley and Rolls Royce to have the most expensive car, yet they are wrong. It is a limited addition Lamborghini. Translated from Italian (Veneno), the Lamborghini venom. The roadster sells for an mind-blowing $4.5 million. With only nine of these supercars created, there is no wonder why the price is so high. This car boasts an amazing 740 horsepower and can top a speed of 220mph and go from 0-62mph in a crazy 2.9 seconds. I wonder how much this car would be on a daily rental? This site is unbelievably awesome. Thanks for finding the best cars. It is proving to be a very reliable sport utility vehicle. What BENTLEY AND ROLLS ROYCE needs to work on and they may have on this latest iteration is a dead foot pedal, the quality of carpeting pile and the leather steering wheel no longer peeling within a year or so. I would consider purchasing a BENTLEY AND ROLLS ROYCE having driven a LAMBORGHINI vehicle since 2005. It is definitely worth the coin.